This vanity has both an all-around look and a modern style. The off-white artificial stone counter and black solid wood base make this piece great for any bathroom. This set from Art Bathe is great for anyone looking for great style and function in their bathroom. With a traditional look and strong design, this vanity will help any bathroom look nicer. This piece comes with a beautiful black plywood base and a black ceramic counter. The simple single-door cabinet is great to keep bathroom items in. Put together your perfect bathroom with this stylish vanity set from Bellaterra. For a bit of traditional style in your bathroom, choose this beautiful vanity. The good-looking black granite counter and red plywood base make a big difference in your bathroom. With a double-door cabinet, this vanity can hold all your bathroom must-haves. Bring a classic look and feel to your bathroom with this beautiful set from Bellaterra. 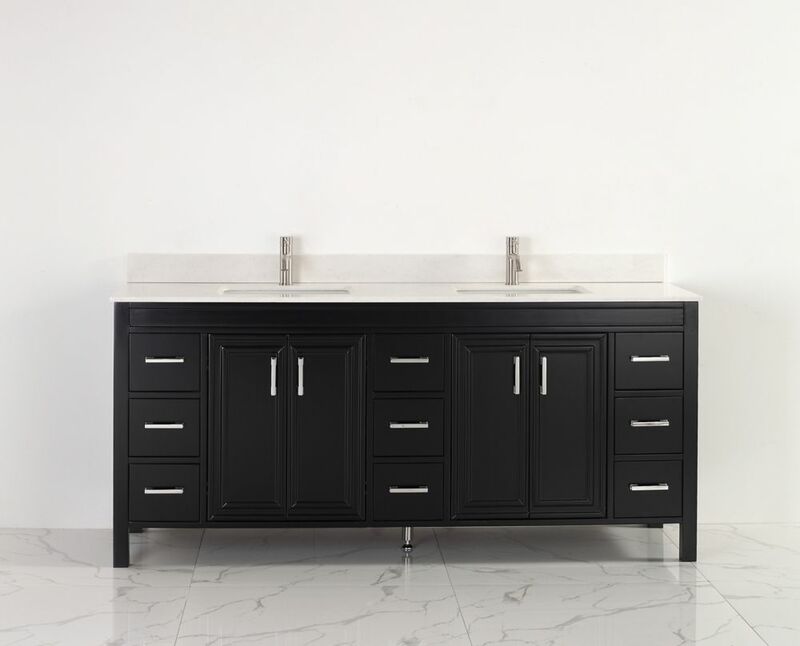 Corniche 75-inch W 9-Drawer 4-Door Vanity in Black With Artificial Stone Top in Off-White, 2 Basins This vanity has both an all-around look and a modern style. The off-white artificial stone counter and black solid wood base make this piece great for any bathroom. This set from Art Bathe is great for anyone looking for great style and function in their bathroom.